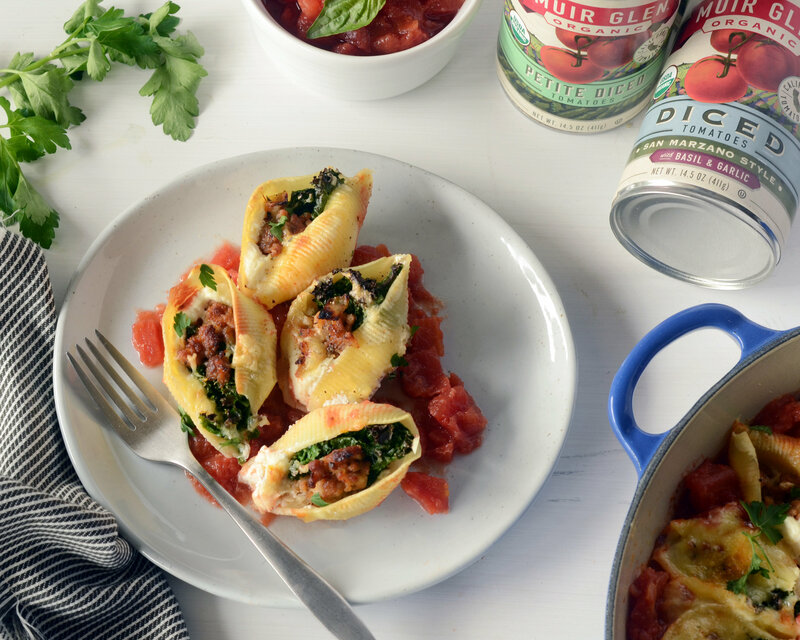 I’m craving pasta in a major way this week, so I’m going for this Sausage and Kale Stuffed Shells dish with Muir Glen Tomatoes. I don’t just choose Muir Glen because they are organically grown — I’m a big fan of their commitment to the environment and producing the best-tasting product with minimal waste. No matter what season tomatoes are in, Muir Glen is my go-to for high-quality canned tomatoes any time of year. Plus, I really appreciate how Muir Glen is picky about what goes into each can - any tomato that isn’t up to their taste and quality standards is composted so waste is minimized at every step. When I’m looking to make a big batch of pasta that will last me throughout the week, stuffed shells are always on my mind. They cook faster than a bigger baked dish like lasagna, are simple to portion out, and I can find everything I need at my local Wheatsville Co-op in Austin. I start with Muir Glen San Marzano Style Diced Tomatoes with Basil and Garlic and fill each pasta shell with delicious fillings like crumbled sausage and kale. Dinner tastes better knowing that I’m supporting my local employee-owned grocery store, plus helping save the world by using environmentally responsible tomatoes, one stuffed shell at a time! Psst! Muir Glen is running a 2/$4 on all 28-ounce canned tomatoes at your local co-op through February 12th! 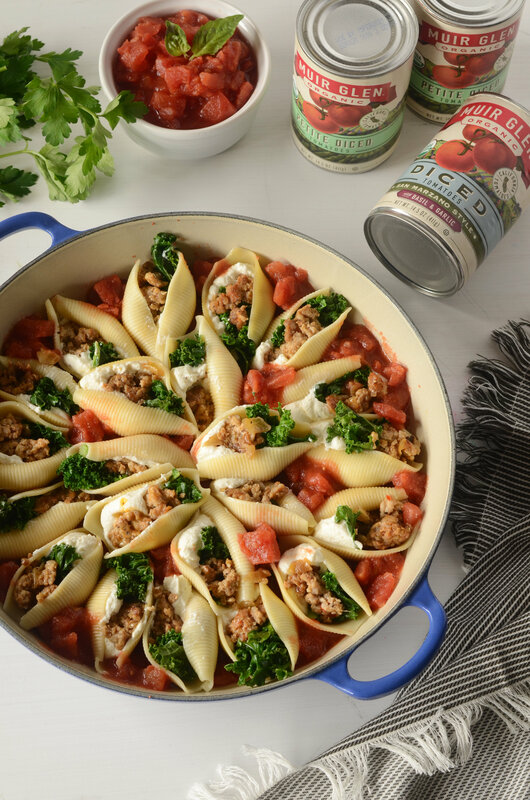 Check out the recipe below for Sausage and Kale Stuffed Shells and run to your nearest co-op for a stellar deal on Muir Glen Tomatoes. Find your local co-op here! Preheat the oven to 350°F. Bring a large pot of salted water to a boil and add pasta. Cook shells for 5 minutes, careful not to overcook (pasta will finish cooking in the oven). Drain completely, rinse with cool water, and set aside. If pasta is starting to stick, toss with a teaspoon of olive oil. Prepare the fillings: In a large sautee pan, heat 1 tablespoon olive oil over medium-high heat. Add onions and sausage, stirring to cook completely, about 8-10 minutes. Add kale and cook another minute. Transfer to a paper towel-lined plate and set aside. In a bowl, mix together ricotta, mozzarella, half of the parmesan, egg, parsley, and 1 teaspoon kosher salt. 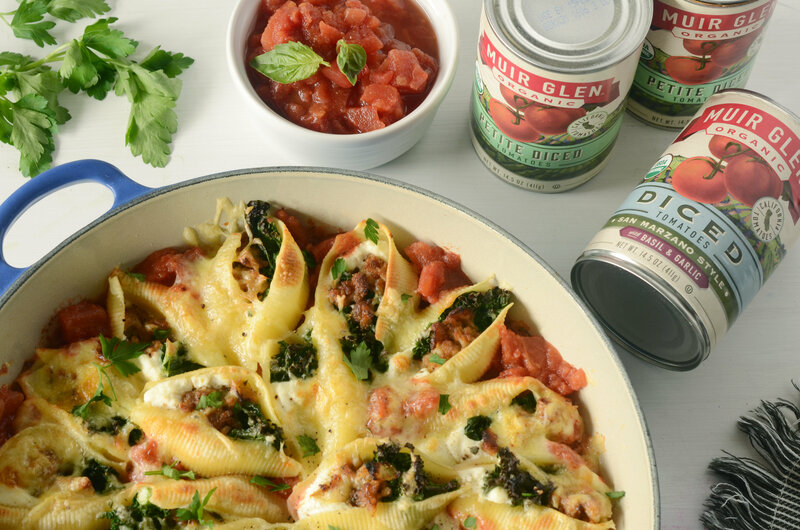 To assemble, add Muir Glen Petite Diced Tomatoes and Muir Glen San Marzano Style Diced Tomatoes with Basil and Garlic to the bottom of a large baking dish. Season with 1 teaspoon salt, pepper, and 1 teaspoon olive oil. 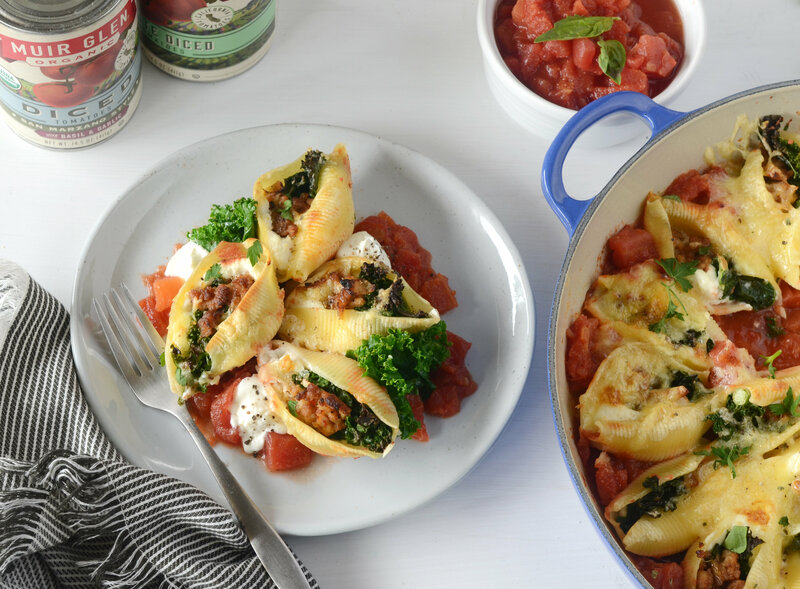 Fill each shell with 2 tablespoons ricotta mixture, and top with an even amount of kale and sausage mixture. 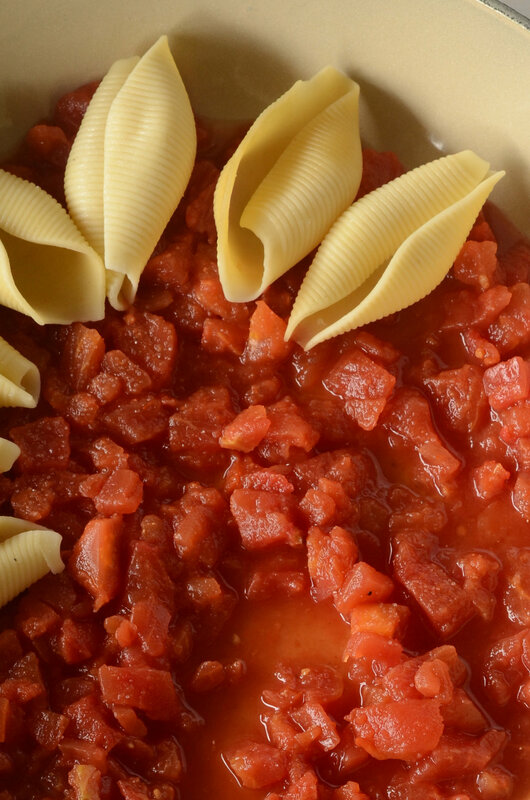 Settle each shell into the tomatoes and repeat with remaining pasta. Top with remaining parmesan cheese. Bake until bubbly and cheese is melted, about 25 minutes. Garnish with basil, if desired.